You’ve probably never fired an M4 carbine. Until a couple weeks ago, I hadn’t either. 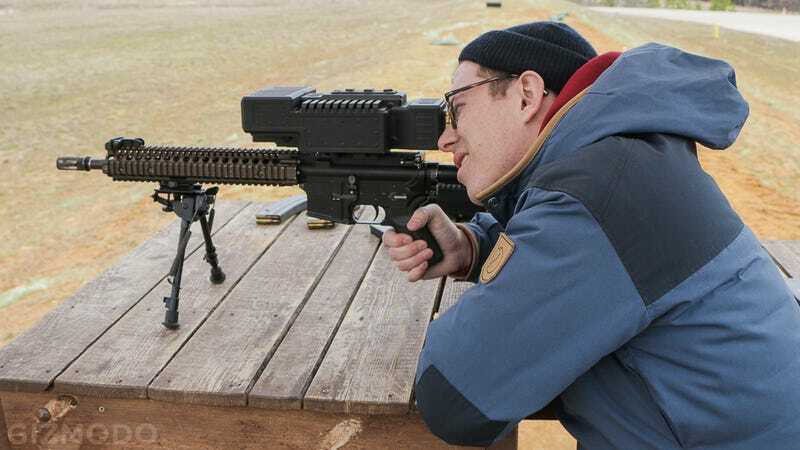 But at a recent DARPA demo day, I loaded a magazine (also a first for me), snuggled up to the deadly assault rifle, and looked through one of the most technologically advanced smart scopes ever built. Then I pulled the trigger. “That’s a hit,” I heard a voice say behind me. The target was only about a hundred yards away, but I hadn’t fired a gun since I earned my rifle shooting merit badge in Boy Scouts. I couldn’t count the number of processes going on inside the futuristic computer on top of the gun, but there were at least four visible sensors on the front. Facing me was a crisp display slightly smaller than a credit card showing crosshairs and some basic ballistics information. In the near future, a weapons system like this might also shoot self-guided bullets—more on that in a second. The craziest thing: The scope isn’t just built to improve accuracy. It aims to improve everything. The M4 carbine is a popular gun in the United States military, but it’s one of many weapons used by soldiers. Virtually all of these have rails that support a seemingly limitless number of accessories, from the most basic optical scope to the most expensive thermal imaging technology. Since each combat scenario requires a unique set of tools, soldiers maybe find themselves weighed down with extra accessories or, worse, swapping out components on the battlefield. So there’s a demand for an all-in-one scope, one device that simplifies the whole setup. Companies like TrackingPoint have been making futuristic digital optics systems for years—including set ups that designed to make the gun aim itself. They’re prohibitively expensive, however, and literally limited in scope. This is where DARPA comes in. The military’s research and development arm excels at solving impossible problems, and the challenge of building an affordable super smart scope is exactly that. Imagine a scope that not only incorporates all of the bulky components a soldier would ever need as well as offer features that top brass have only dreamed about. Imagine a network-connected scope that sends ballistic data back to base. Imagine a scope that not only helps soldiers aim but also tells them who not to shoot. And imagine if that scope fit in the palm of your hand and weighed only a few ounces. It’s somewhat humbly called the Computational Weapon Optic (CWO). Built within DARPA’s Transformative Applications (TransApps) ecosystem—the same system that DARPA developed to power smartphones and tablets on the battlefield—the device is exactly what it sounds like: a computer that you attach to a rifle. I was the only journalist at DARPA’s recent demo day, surrounded by high-ranking officers of several branches of the military, most of whom were wearing fatigues. The live fire demo served as a proof of concept for the Computational Weapon Optic, as well as a chance for the top brass to decide if they might devote some budget dollars to developing the technology further. By the time Doran Michel, the (now former) program manager of the TransApp program wrapped up the demo day, I was sold. I’m pretty squeamish at the thought of technology that’s designed to help soldiers kill better, but the emphasis DARPA placed on the Computational Weapon Optic seems geared towards more efficient defense rather than more vicious offense. Or at least that’s the pitch I got. I asked if I could look through the scope to get a better idea of the experience. A few minutes later I had a magazine in one hand and the M4 carbine in the other. There’s nothing about holding an assault rifle that doesn’t feel dangerous or deadly. Mind you, I’m just nerdy blogger with no military experience. So when I tucked my cheek down onto the cold steel, my hands were sweaty. When I flipped the safety switch off, my finger was shaking a little bit. I can’t imagine what an 18-year-old in Afghanistan must feel like at that moment. When I looked into the high res display on the Computational Weapon Optic, the first thing I thought of was Call of Duty. This is pretty silly, since I’ve never played Call of Duty—though I was a pretty big DOOM enthusiast back in the day. Something about crosshairs on a digital display gave me feelings, though. I have mixed thoughts on the military and games, but something about that screen made me wonder. I squeezed the trigger. Firing an M4 carbine kind of hurts. It’s an extremely loud and powerful weapon. Frightened as I secretly was, though, the super smart scope made everything seem more controlled. Maybe it was something about the comfort of a computer doing calculations while I re-learned the feeling of firing a weapon. Maybe it was something about the display blinking with information. Maybe it was the DARPA pitch. The natural assumption is that a smart scope helps you see your target better in a variety of conditions. But like I said before, the Computational Weapon Optic is designed to make everything better. For starters, the scope makes it quick and easy to zero the scope, when it’s first mounted on the rifle. (Zeroing a scope is usually a time-consuming process that amounts to calibrating the optic after it’s first mounted.) The Computation Weapon Optic’s connectivity also makes it easy for a coach to guide a new shooter through the process through a tablet. Like the rest of the TransApp ecosystem, the scope runs a highly customized version of Android that’s compatible with a number of devices. The whole system is also controlled with three simple buttons on the top of the scope. The Computation Weapon Optic also helps soldiers work together. Multiple scopes can be networked through the standard issue Type-1 handheld radio, so shooting can be synchronized. Soldiers already do this in order to fire at a target without giving away their position, but it’s currently done with voice commands over the radio. Radio chatter, quite ironically, is a great way to give away a soldier’s position. So instead of hearing a countdown, the soldiers see commands on the scope’s display. This is where things get really futuristic. The Computational Weapon Optic is not only equipped with an optical scope but also night vision and thermal imaging. There’s a laser rangefinder and magnetometer to help determine distance to target. Thanks again to the networking capabilities, fellow soldiers can see the expected trajectory of their bullet on a smartphone or tablet as well as the exact distance to their target. This obviously makes aiming easier. All that, and the whole setup could be cheaper than some of the military’s more complicated solutions that offer fewer features. Meanwhile DARPA’s developing other smart scope technology, like the One Shot XG for snipers. Then there’s the Extreme Accuracy Tasked Ordnance (EXACTO) ammunition project. That’s the self-guided bullets mentioned above, but it’s also designed for snipers. The Computational Weapon Optic can communicate could help any soldier with a rifle. This is only the beginning. When I visited DARPA’s TransApp program office last year, I wasn’t struck by how advanced the software was. I wasn’t even blown away by the implications, as vast and exciting as they truly are. I was stunned at how out of touch the Pentagon was in terms of innovation. Soldiers told me how some troops in Afghanistan were still using paper maps from the 90s. So an Army private being deployed might be navigating his hometown with GPS on a smartphone one day and then confined to a pencil and protractor in combat in Afghanistan a few weeks later. There are a lot of reasons why every soldier isn’t issued a smartphone along with a rifle, but over the past five years DARPA’s TransApp program has made progress in building a foundation for a tech-first future. The software ecosystem not only makes smartphones and tablets useable and useful on the battlefield. It enables all of the technology in a soldier’s toolkit to work together. Now, the software can power weapons systems like the Computational Weapon Optic as well as cheap helmet-mounted displays that put satellite imagery and maps right in front of soldiers’ eyes. The TransApp team has already built one, in fact. Now think even further ahead. What could the military do with virtual reality? Well, the TransApp program already thought of that, too. The DARPA team came up with something called Crystal Hull for armored vehicles. Using a VR headset like the Oculus Rift a low cost 360-degree camera, this system would enable tank drivers to see in every direction, while making use of the TransApp mapping features. Mission data is stored automatically, just like the ballistics information from the Computational Weapon Optic, so commanders can keep track of their soldiers in real-time without dangerous radio chatter. I tried out Crystal Hull myself and navigated through city streets as if my vehicle were made of glass. To access mission data, I used a standard Xbox controller, which the TransApp team liked because it would make immediate sense to soldiers. Again, it felt weird to treat war like a video game. But really, these types of innovations are just making use of the same technology that makes video games work. They’re making the military work better, too. There are a lot of reasons why the military may or may not arm soldiers with DARPA’s latest creation—many of them involve taxpayer dollars. But as I drove away from the base, my finger stinking like gunpowder, I thought of one reason why any peace-loving American should care. The military is treating technology and innovation differently. And it’s a very good thing to see the Pentagon bucking its overly bureaucratic past and trying to act more like Silicon Valley.